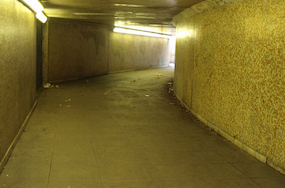 As those people who do use the subway under the Hagley Road at the Kings Head junction will know, during periods of heavy rainfall (not unknown lately) it has a tendency to flood. This can be inconvenient to many people, but to the blind or partially sighted it can be something they are only aware of as their shoes start to fill up with water, which was something which was brought to our attention by a blind resident recently. So, whilst we are waiting for work to start on the junction (now due in March) local volunteers and traders, inspired by Richard Marshall from the Traders’ Association, have agreed to carry out regular checks on the subway to let us know if it is flooding, and we will post the information on here and facebook, and if readers are aware of any visually handicapped people who may use the subway, then perhaps they could let them know. We may even be able to erect signs during periods of bad weather to warn folk. Not an ideal solution, I acknowledge, but it would seem we have no chance of getting the repair work done in advance of the roadworks. It will, of course, have the benefit of informing those without visual disabilities too. Anyway… the good news is, this morning the subway is clear! Where do you want info posting? I live next to it so can update if I see it’s flooded. Mark, that’s great. If you could e-mail me or post a comment on the blog, I’ll pick it up from there. Thanks.